Woke up this morning to another beautiful, sunny day on the appropriately-named Costa del Sol. 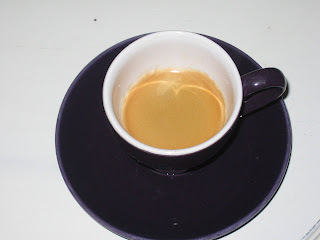 First thing I did was switch on my newest kitchen gadget – the FrancisFrancis X6 and made another perfect espresso. I got my machine via Espresso Coffee Shop. I’ve had several different espresso makers from the dependable Moka from Bialetti to the pump-style La Pavoni and the fully-automatic Saeco but nothing beats the FrancisFrancis. Cool design that works and makes a consistent espresso using ESE pods from illy which has been my coffee of choice for many years now. 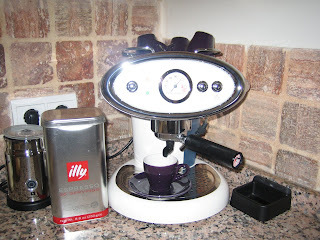 The current favorite of coffee lovers is the Nespresso which is fine but nothing beats an illy espresso. My advice is to get the new Nespresso Aeroccino though which does away with the constant mess of steaming milk. This little machine froths or steams milk in less than a minute and is so easy to use that I never have to leave home to have a super capuccino or caffe latte. Saw the wbsite – can’t wait to try out Wackers (funny name though). Seems like the espresso entry is generating lots of comments.Did you have a look at the espressocoffeeshop site? Also, try http://www.illy.com although I think they only have online shops in the UK, France and Italy.